Slots are currently the most popular casino games. The basic rules of this game haven’t changed since 1899 when Charles Fay assembled the first slot machine. A player bets and spins a set of reels with symbols. Each of these spinning reels stops at a random position. The player wins if the reels stop in a way that they make a line of the same symbols. The rarer the winning symbols, the higher the amount of the win. The size of the win for each winning combination is defined in the paytable. Nowadays the randomness of mechanically stopped reels has been replaced by random numbers generated by a computer, but the principles remain same. These principles of randomness are honoured by every licensed game provider. The randomness of slots has several very interesting consequences, and it is important for every smart slots player to understand them. "The principles of randomness are honoured by every licensed game provider." The majority of online slots still use reels to represent the result of each spin. Despite the fact that the reels are rendered by a computer, the game math under the hood still has 3 to 5 sets of symbols (virtual reels) that stop at random positions. Why change something that has worked fine for years, right? Modern online slots have a lot of new features which wouldn’t be possible with mechanical reels. Expanding wilds, scatters, free spins, bonus rounds, and others. There is one thing all fair slot games have in common: the outcome of each round is based exclusively on a random number provided by a Random Number Generator (RNG). The random number generated by the RNG "tells" the reels when to stop and therefore decides the outcome of the game. That means that the same game with the same random number must always give the same outcome. The higher the size of your bets, the higher (usually) the RTP of your betting system. We assume that all the other rules of the betting system remain the same. RNG generates a random number. The game’s mathematical module takes the random number and calculates where the reels should stop. The game stops the reels at the determined positions and calculates the outcome of the spin. The outcome of the spin is then displayed to the player who initiated the spin. Your win (or loss) in every round is determined purely by your luck. The outcome isn’t influenced by your previous wins/loses, nor the wins/losses of other players, nor by anything predictable. It’s just you and electromagnetic noise in the RNG – simply pure gambling. The outcome of a game isn’t influenced by your previous wins/loses, nor the wins/losses of other players, nor by anything predictable. This reminds me that I should explain how RNGs work. 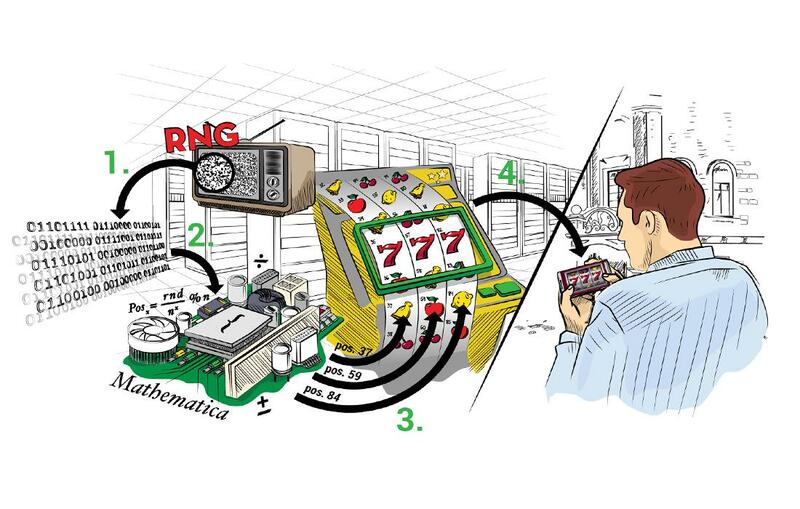 Modern RNGs used in online casinos are dedicated hardware devices that generate random numbers out of electromagnetic noise. It’s like an old television without signal – a lot of black and white dots. Black pixel is 0, white pixel is 1. Take a photo of a small part of a TV screen, convert the pixels into 1s and 0s, write them into a text file and you have a random number. RNG hardware generates thousands of random numbers every second. So on one hand, you will change the outcome of the next round if you press the start button one second later. However, on the other hand, you have no chance to predict whether the outcome will be better for you or not. So the fair randomness remains. Now you may ask: if slots are not manipulated, how do casinos make money on them? The answer is simple: Slot games are designed in a way that they pay out less than players bet in the long run. Imagine a simple game: you give me $1 and flip a coin. If you get heads, I’ll give you $1.50 back. If you get tails, you lose. It’s quite obvious that the chances are on my side. You can win if you are lucky and play only a few rounds, but I have a clear advantage in the long run. The randomness of this game is fair, but the long-term chances aren’t. Game math combined with fair random numbers gives the casino a long-term advantage over players. And that is how casinos make money. "Game math combined with fair random numbers gives the casino a long-term advantage over players." Now that I have explained how fair slots really work, it is time to bust several popular myths about slots. Myth 1: "Slots have cycles of winning combinations. You can win by observing these cycles and by jumping in during a winning part of the cycle." This is a myth, as slots really work based on fair random numbers. The advantage of the casino is hidden in the game math, and there is absolutely no need to complicate the entire system with any type of cycle. In reality you may observe hot streaks and cold streaks. But that’s just a result of natural randomness and these streaks are absolutely not predictable. Myth 2: "Slots are programmed not to pay after a big win and to pay more when they’re full of money." This is a myth which probably comes from the days of standalone slots which paid out to the winning player directly. But it was as much of a myth then as it is now. If you won more money than the slot machine could pay out, you got the remainder from casino staff. Modern slot machines are connected to a central server and all wins are paid out by casino staff, so there is no need to keep the amount of cash in a slot machine in mind. Random numbers work just fine and this myth is invalid. Myths 3 & 4: "Autoplay features pay less than clicking the spin button manually" & "Pulling the ledger on one-armed bandits gives you better odds than pressing the spin button." Both of these myths make no sense to those who know how online slots work. The game math remains the same, and random numbers remain fair, whether you use the autoplay feature, the ledger or the spin button. Running a casino and creating good games requires different sets of skills. Moreover, players like to play the same games over and over. Those are probably the reasons why specialized companies which focus solely on creating casino games were established. It’s also the reason why you can play Starburst slot in so many casinos. NetEnt (the company which created Starburst) is an independent company. Casino initiates your gaming session. Your browser communicates with the servers of the game provider, not with the casino. 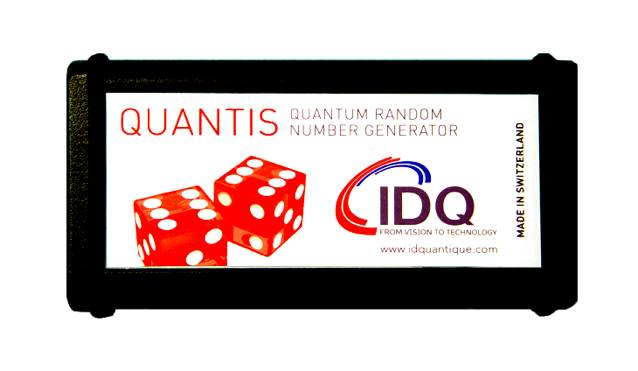 The random number and round outcome is also generated by an independent company (the game provider). Casino just confirms your bets and is notified about your wins by the game provider. There is one very important implication of this: if you are losing too much while playing a game from a reputable game provider, you can be quite sure that it’s just your bad luck. Even if you play your favorite game at an unknown casino, you are quite safe, in terms of game fairness (though you may be not safe in terms of actually getting your money – use our casino reviews to find a reputable casino that actually pays the money out, even when you win big). I’ve had gaming sessions with an RTP below 50% in the past. Player presses the spin button in a slots game in his browser. Game sends a "spin" message to the server of the game provider. Server of the game provider calculates the required bet. Server of the game provider asks the casino to deduct the amount of money required for the spin. Server of the casino confirms. Server of the game provider requests a random number from the RNG. RNG replies with a fair random number. 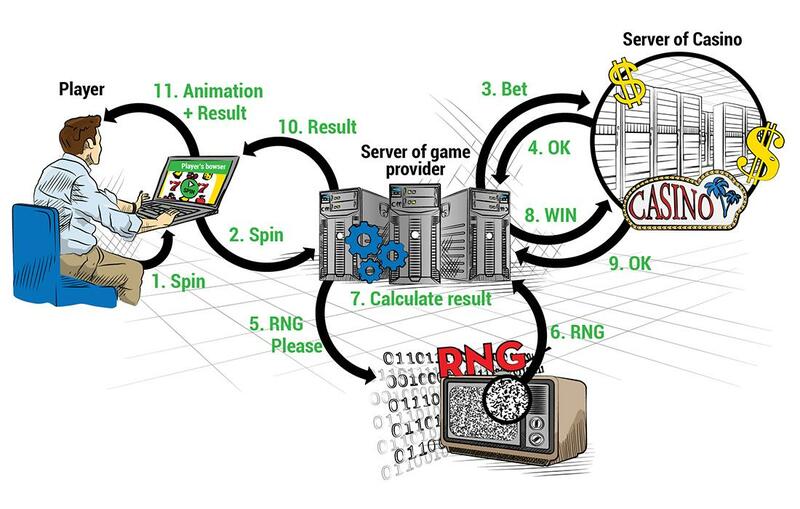 Server of the game provider uses the random number to spin virtual reels and calculates the outcome of the game round. 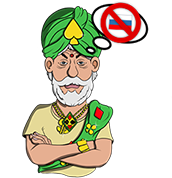 Server of the game provider asks the server of the casino to add winnings to the player’s account. Server of the casino adds the win and confirms. The outcome of the round is returned to the game which runs in the player’s browser. The outcome of the round is animated and displayed to the player. And all this usually happens within less than 200 milliseconds :). RTP and volatility are the 2 most important mathematical characteristics of a slot game. They basically influence how much and how often you win. However, it is a bit more complicated, so I will try to explain them to you. If a game RTP is 96%, it means that if you start with $1,000,000,000 and then play 1,000,000,000 rounds at $1 each, then you should end up with approximately $960,000,000 dollars. If you play just a few hundreds rounds, your current return may vary from 30% up to 1000%. But the more rounds you play, the more likely you’ll be closer to the statistical RTP of the slot game. That’s why I used such big numbers in the example above. The most common RTP of online slots is around 96%. Some slots like Blood Suckers have an RTP up to 98%. "The most common RTP of online slots is around 96%." RTP is a very popular characteristic in online slots because it can be expressed as a single number. It is easy to compare, and the most of the popular game providers declare the RTP of each slot game. Then it’s easy to write articles like "Top 10 best paying slots". RTP can be used for various simplified calculations, like how much you can expect to lose from a bonus while rolling it over. These simplified calculations are good to impress your friends while drinking beer. But for more serious calculations (like those which we did in our bonus hunting article), you’ll need to count volatility as well. When betting on color you can win 2 times your bet and you win quite often (18 of 37 rounds). When betting on number you can win 36 times your bet but you win only in 1 in 37 rounds. The volatility of roulette can be easily expressed in numbers from 2 to 36, depending on what type of stake you take. Higher volatility means that your individual wins will be higher. However, you will win less often and you are more likely to lose your entire budget faster. This chart shows the share of total wins paid out as various multiples of the bet. 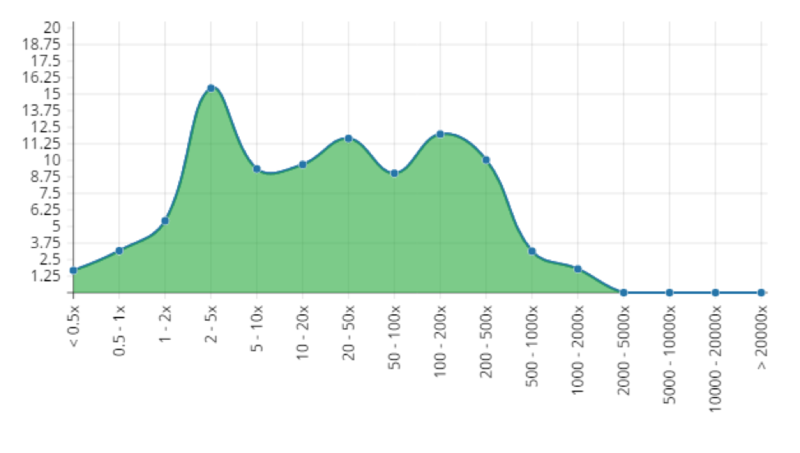 For example, the chart above displays that 15% of total wins are paid out as individual wins with sizes ranging from 2x to 5x the bet, and 10% of total wins are paid out in higher individual wins from 200x to 500x the bet. As volatility can’t be expressed as a single number, game providers usually only classify slot into either "low", "medium", or "high" volatility categories. These categories can’t be effectively compared, nor used in any calculations, but they can give you at least a basic idea about the volatility of the game you are about to play. Finding the real slot volatility (in the form of the chart presented above) is a very difficult task. Basically, you have to reverse-engineer the reel set of a game and properly estimate probabilities of other special game features. Even for me, this is a task that would take a day or more (depending on the slot’s complexity). Slot volatility can be roughly estimated from the paytable and the reel set. Look for the highest winning combination. What is the chance of hitting it? How much will you win? I personally like high volatility games as you can win higher amounts, so you can have the same thrill with lower stakes. And lower stakes mean that you’ll statistically lose less. This effect can easily compensate for a slightly lower RTP. For example, lotteries often have an RTP of 50%, but the chances of winning the jackpot and becoming a multimillionaire keeps the masses playing it. Even my mom sometimes buys a lottery ticket and imagines what she would do if she won. And she would never, ever throw a single cent into a slot machine. When not taking into account the lottery, slots are the most volatile type of game you can play in a casino. The advantage of high volatility can beat the high RTP of games like Blackjack or Roulette. To learn more about volatility and RTP and how they influence your chances to win, read this article. Use the double up button (black/red). RTP remains same and you can easily increase the game volatility to desired values simply by gambling until you win a big enough amount. Change the number of paylines to 1 and increase the bet per line. The chances of hitting a win in that particular line are lower, but you can expect much higher wins. Try that with our online free slots in demo mode if you don’t believe me ;). These are basic tips that can help you. However, if you really want to know how to get the most out of playing slots, read the following article.